We use our hands for so much throughout the day that wrist pain can be very debilitating. The most common cause of wrist injuries is falling onto an outstretched hand. This may cause the wrist ligaments or bones to become damaged. Some wrist injuries are classified as wrist sprains while others are considered a broken wrist. Understanding the difference will help you get the correct treatment from your Jacksonville orthopedic specialist. Contact our hand and wrist specialists to take advantage of their specialized knowledge and training in this area. What Is the Physiological Difference between a Wrist Sprain and a Broken Wrist? The wrist is anatomically complex. A wrist sprain occurs when a ligament in the wrist is injured. Ligaments are bands of connective tissue that stretch from one bone to another. Wrist sprains typically involve stretching or tearing a ligament. In contrast, a broken wrist occurs when you actually fracture a bone in the wrist. The wrist consists of 13 different bones, and any of these could be fractured during an injury. This could be as small as a hairline fracture in the bone, but a broken wrist can cause major pain. Range of motion.Gently attempt to rotate your wrist. 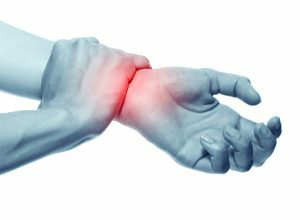 In a wrist sprain, you may be able to experience the entire range of motion (although it will be painful to move the joint). Characterize the pain.The severity and intensity of pain depends on the injury. Generally, however, a broken wrist is described as an intense, sharp, stabbing pain. In contrast, a moderate to severe wrist sprain may be more of a throbbing pain. This is due to torn or stretched ligaments. Assess crookedness.When the bones of the wrist are broken, they cause the joint to look crooked or misaligned. In contrast, a wrist sprain results in swelling but does not typically cause crookedness. In very severe cases, a broken wrist may have bone protruding through the skin. X-ray.An X-ray remains the best way to differentiate between wrist fractures and sprains. The best way to determine whether you’re experiencing a wrist sprain versus a broken wrist is to visit an orthopedic specialist. Our Jacksonville orthopedic surgeons can conduct a thorough assessment to determine the extent of your injury. Call us today to schedule an appointment with one of our specialists.